Specialists in power flushing, descaling & chemical cleansing. A build up of deposits in your central heating system can depend on several factors, if left unattended it can reduce the efficiency of your heating system, cause failures in your radiators and blockages in your primary pipework system. You will be left with higher bills for heating and repair bills for replacing pumps, valves and pipework. The Remedy? 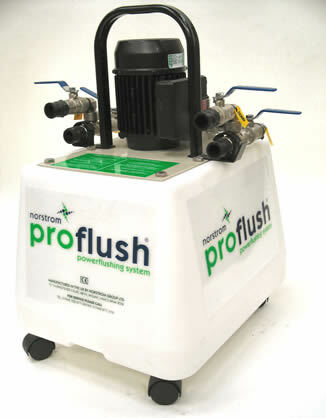 To remove the sludge and deposits by power flushing your system. Each heating system installation is unique, their condition depends on type, usage and age of the system. We provide a free, no obligation, inspection of your heating system. In many cases the solution can be minor surgery to you existing system. In either case we can help. 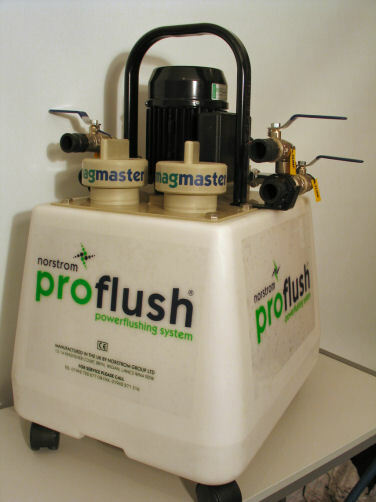 Perkins Plumbing use the latest addition to the range, the proflush magmaster with integral magnets for a cleaner flush. We are listed on their list of approved contractors. Are you finding that most of your radiators remain cold (or lukewarm at best), despite continually turning up the thermostat? Or are they taking too long to heat up to maximum capacity? Or do some only heat up in some places, and not others? If any of these are the case then you might find that you have a clogged up central heating system. This occurs over a long period of time, as sludge and sediment gradually starts to accumulate in both the pipes and radiators, until the blockage prevents your heating panels from warming up properly; the boiler lacks the power to pump the heat through the level of waste and scale that’s gathered together, and as a result the poor circulation of your heating system leaves you and your family craving the warmth that, although it isn’t there, you’re ultimately still paying for. So what’s the best solution? Well, the best thing to do is call Perkins Plumbers to first of all assess the damage and locate the major sources of the problem. If it is simply a case of a blocked heating system, then we will most likely recommend that you power flush your central heating system. This involves hiring Perkins Plumbers professional, fully qualified engineer to clean the system by essentially ‘flushing’ out all of the built-up dirt and sludge from each outlet and/or clogged pipe, using the most effective tools and fast-working chemical solutions. But how much does flushing a central heating system cost? An additional £25 per radiator after that (up to a maximum of 20 radiators/outlets). You might think this sounds a little expensive for what is basically a ‘clean’ of your system, but power flushing central heating system costs can be ‘recouped’ in reduced energy bills, less wasted heat and the time and money you save on potential follow-up repairs that, when you leave a clogged system unattended, could escalate into a major system overhaul. Therefore it is always advised that you pay the up-front power flush central heating cost by budgeting carefully and comparing a number of different quotes from several companies; some even offer a free follow-up check, so be mindful of looking out for deals that could save you even more cash! Either way, power-flushing your central heating system will certainly seem worth the worry when you can relax in the warm, cosy comfort of your own home again. Copyright © 2014 Perkins Plumbers. All rights reserved.